Riverside Mountain Bike: Riverside State Park contains 8,000 acres of prime recreation land in the middle of Spokane. The area is crisscrossed with miles of trails, most of which are open to mountain bikes. The paths offer fun cycling to riders of all ability levels from single and double track to paved trail. One of the most scenic trails follows the churning Spokane River past water-sculpted boulders and craggy cliffs. This 7.2-mile loop is moderately difficult. The route travels on 4.3 miles of singletrack, 2.7 miles of dirt roads, and 0.2 mile of pavement. The trails and roads are in good condition, with some technical stretches of rock and sand. There are many trails and roads to explore in Riverside state park; only the park’s equestrian area and the Little Spokane River Natural Area are closed to bikes. 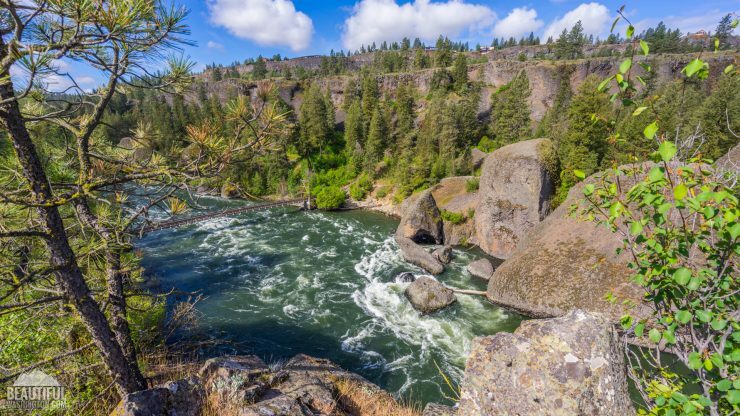 Description: Riverside State Park contains 8,000 acres of prime recreation land in the middle of Spokane. The area is crisscrossed with miles of trails, most of which are open to mountain bikes. The paths offer fun cycling to riders of all ability levels from single and double track to paved trail. 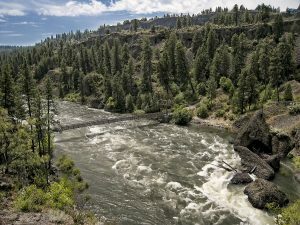 One of the most scenic trails follows the churning Spokane River past water-sculpted boulders and craggy cliffs. This 7.2-mile loop is moderately difficult. The route travels on 4.3 miles of singletrack, 2.7 miles of dirt roads, and 0.2 mile of pavement. The trails and roads are in good condition, with some technical stretches of rock and sand. There are many trails and roads to explore in Riverside state park; only the park’s equestrian area and the Little Spokane River Natural Area are closed to bikes. Guide Review: Riverside State park has a maze of single-track mountain bike trails that take you to the most beautiful lookouts throughout the state park. The first time I rode at Riverside I was shocked with the amount of fun I had. I rode from lookout to lookout, each one better than the next. The most surprising thing is that as I was riding to each lookout, I was being challenged with some great trails. As I reached the end of the park I was bummed because I hate riding the same trail twice! But lucky for me Riverside had enough trails so I didn’t have to ride the same trail twice. I highly recommend riding out to the state park and making your day an adventure!